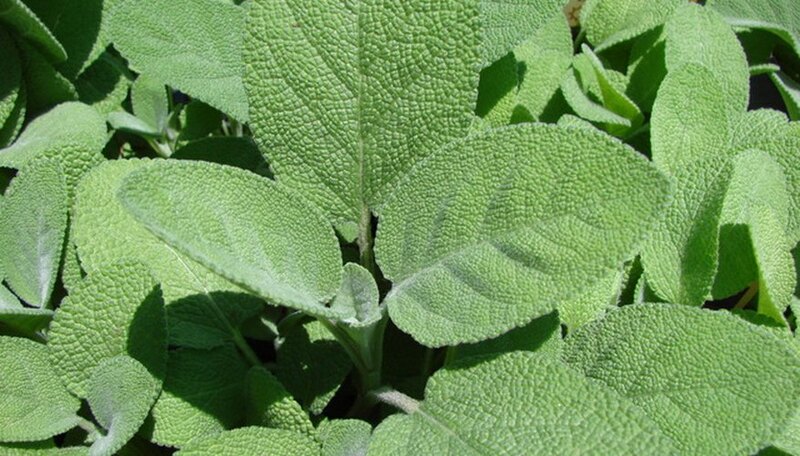 Sage (Salvia officinalis) is an indispensable culinary herb. It's a favorite in stuffing and for seasoning chicken, lamb, pork sausage, turkey and wild game. In the garden, sage adds texture and dimension to the landscape. Sage can also make a contribution to your indoor landscape as a houseplant. A hardy perennial, sage can be cultivated indoors in a sunny window and harvested year round. Enjoying fresh sage when cooking is easy with a potted sage plant nearby. Growing to a height of two feet outdoors, expect potted, indoor sage to grow to half that height. Pruned plants can maintain a tidy, bushy appearance that will make them an attractive focal point and conversation piece. Select a small sage plant that is bushy and uniformly green. Specialty color varieties like yellow sage and tri-color sage will also flourish indoors. Repot small plants into 4- to 6-inch pots to which you have added a layer of pebbles to the bottom for drainage. Fill the pot 3/4 full with a quality potting soil. Score any exposed, ropey roots and add the plant to the soil. Cover plant roots with soil to the base of the stem, firm into place and water thoroughly. Provide sage with a minimum of six hours of bright light a day. Place the plant in a western or southern facing window for the warmest light. If you notice the plant becoming leggy, it needs more light. Moving it closer to the window may help, but the best solution to a low-light problem is supplementing natural light with plant grow lights. Place sage where it is out of drafts created by heating vents, open windows or exterior doors. Keep sage uniformly moist but never let its roots sit in water. Wash sage in the sink or shower once a month to keep the pebbled leaves free of dust. Harvest sage leaves as needed, but don't harvest more than half the plant in a season. Shape the plant periodically to keep it from looking uneven. Cut out woody growth as needed. Sage contains plant estrogens that can help reduce the symptoms of menopause. Try a soothing sage tea before bedtime to help control night sweats. Another interesting sage variety to keep indoors is pineapple sage (Salvia elegans). It is a larger plant, growing to 3 ft. indoors, and has a light, refreshing pineapple aroma. It is not winter hardy, so placing it in the garden in spring and bringing it indoors to overwinter is a way of cultivating this interesting plant in areas that have freezing winters. Sage will root easily from a stem cutting. As sage ages, it becomes woody. To keep sage handy for cooking, plan on replacing plants every three years. S. A. Holt is a freelance writer with over four years of experience creating clean, accurate copy for print and Internet clients. She has a Bachelor of Arts in English and enjoys spending her time reading and writing. Her clients include the Uncle John's Bathroom Reader book franchise and others.